History: 55 year old male with a right lateral chest wall mass seen on a prior chest radiograph. T1W coronal MR image of the chest reveals a large heterogeneous T1 isointense mass in the right lateral chest wall, invading the intercostal muscles and compressing the right upper lobe of the lung. T2 weighted MR image of the chest shows marked T2 hyperintensity of the mass, with a more easily defined component extending through the lateral chest wall. 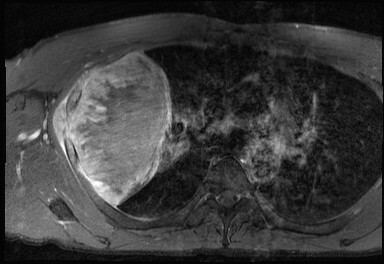 T1 postcontrast with fat saturation reveals peripheral enhancement of the mass with heterogeneous hypointense regions, likely compatible with necrosis. 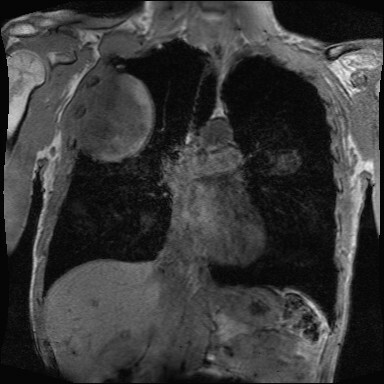 The differential diagnosis for the right lateral chest wall mass visualized in the three MR images above includes mesothelioma, primary lung carcinoma, soft tissue sarcomas such as fibrosarcoma and malignant fibrohistiocytoma, fibromatoses such as desmoid tumors and musculoaponeurotic fibromatoses, and less likely primary rib lesions such as chondrosarcoma and osteosarcoma. 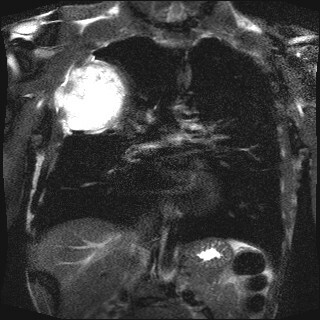 The final diagnosis was sarcomatoid mesothelioma.